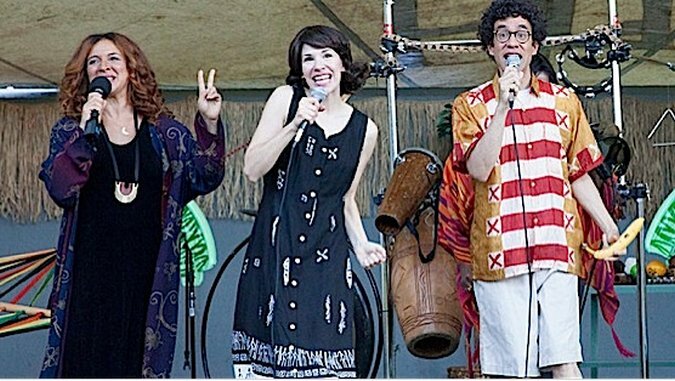 Can Maya Rudolph guest star on every episode of Portlandia? Re-teaming with her old Saturday Night Live co-star Fred Armisen for this week’s episode, “Bahama Knights,” reminded us just how much we’ve missed her presence on the small (and large) screen. The musically inspired episode played to the cast’s strengths. (In case anyone has forgotten, Carrie Brownstein is Sleater-Kinney’s guitarist/vocalist, and Armisen was a drummer in a number of punk bands before he forged the comedy-acting road.) And Rudolph, well she’s earned her vocal chops through the sheer number of impersonations she’s done through the years, from Beyoncé to Gwen Stefani, and our favorite nonmusical celeb impression of hers—Oprah. Rudolph plays Peter’s ex-wife, Anita, who’s currently on tour with their old band, Bahama Knights. Nance (his current wife) suggests that he call Anita for tickets to the Portland show. In an awkward reunion in Anita’s dressing room, the singer’s a little too happy to see her ex, kissing him lightly on the lips, telling him “Being married to you, Pete, was one of the best times of my life,” and using the hilarious term of endearment: “stutter cup” (he has that nervous stutter)—all while Nance is standing right there. Instead of fighting for Peter, Nance just grins and bears it as the former couple makes small talk about the movie, Titanic. (“It sank!” and “It never came up!”) Nance seems to have lost all the sass she had in the ”Spyke Drives” episode; and with Peter re-joining the band on tour, it’s looking like Nance might lose her man, too. Rudolph brings back her SNL diva-esque persona (all while rocking a muumuu). In a brilliant casting move, Anita’s backup singer and guitarist are the jazzy, new-agey folk duo Patti Cathcart and Tuck Andress (better known as Tuck and Patti). The couples are mirror images of each other onstage—it’s a meta moment for the show. Another standout sketch featured Armisen and Brownstein as music producers Trudy and Craig, who are trying to coach an inexperienced folk singer—aka Wilco’s Jeff Tweedy—through his new song. He wants to sing about coal oil fires and dusty hearts, but since he’s never experienced a coal-oil fire like Woody Guthrie (that’s how his sister died), they tell him to write about what he knows. The camera cuts to a gig where Tweedy’s now singing about smoke alarms, beeps and dead batteries. It’s sublimely funny and a little sad because something close to this happens in recording studios every day. The accompanying cheesy, grainy music video only emphasizes the laughable lyrics like, “It takes two bananas to make the perfect daiquiri” and “Our two bananas make a better recipe.” But it’s Rudolph, with the help of Tuck and Patti, who steals the stage from Armisen and Brownstein as she chimes in: “When you add a third banana … the drink becomes too sweet.” She sings and moves with conviction—channeling her own inner Patti Cathcart.